together as one giant-cascading song, she opted to performed portions of three-select songs: "Blaxploitation," which bled into "Prayer Song," and then "Don’t Forget About Me," the more solemn record of the bunch, also occupying the fulcrum point of Room 25. Surprisingly, the three-song medley marked her Television debut. 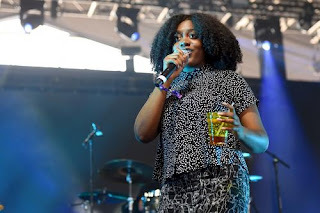 The bug-eyed rapper deferred to her bandmates at key bandmates to create a sonorous power exchange, with the percussion rattling like a cage. The full arrangement of her enlisted bandmates consisted of a bass guitarist, a jazz guitarist, a keyboardist, a drummer, and three harmonists to "echo her thoughts." Like a true performer enrapt in her performance, all her gumption came undone with the final toll, as she shyly thanked the crowd for their attention during the medley. Host Stephen Colbert then jumped onstage excitedly to congratulate her, and together they motioned to the commercial break. 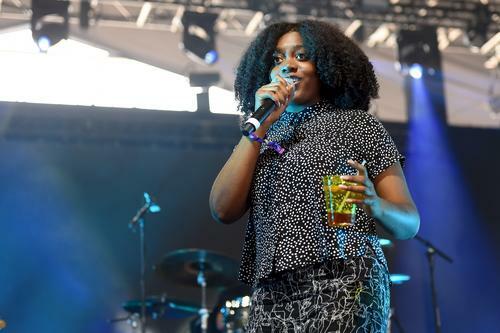 Noname's new album Room 25 has received roaring reviews right out the gate. Just a few days ago, the rapper vowed to change the cover art to the project after hearing of sexual allegations against the artist. The cover remains unchanged (on streaming platforms) as of this writing.